This improved beer glass is thicker than their last glass model and should hold up much better. I've broken one of my older model New Belgium glasses in the dishwasher so the thicker glass walls are a welcome change. This glass is laser etched at the bottom similar to the Sam Adams glass and will cause a constant stream of bubbles to flow from the bottom of it. I'm going to have to pick up a couple of these for my collection. These glasses cost $10.00 for a 2-glass set. A bit more expensive than a typical pint glass but well worth it. These are available on-inline at the brewery store or at the brewery tasting room or in selected retail stores where New Belgium is sold. 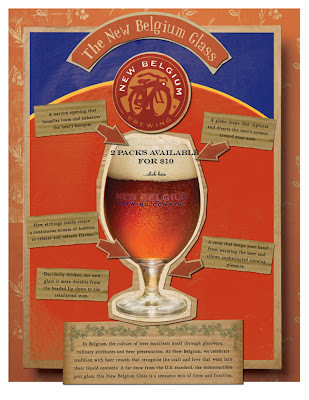 - New Belgium tap room revisited.